during my recent conversation with a korean native, he queried me if i had been in south korea to which i concurred enthusiastically with a wide smile to follow with a response of seoul, jeju island, nami island and busan when he asked which south korean regions i've been to. he followed up with another - what was my top favorite, i even surprised myself with my response of "busan" to which he looked at my quizzically, understandably so. i love seoul too but busan had a special charm that crept into the heart to claim a spot. 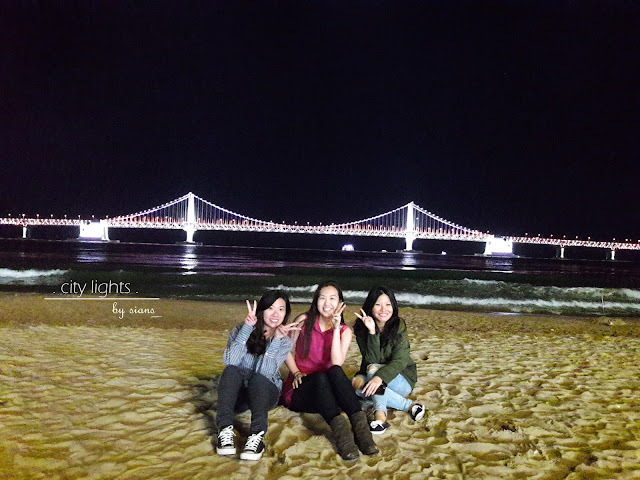 #sianstakesonbusan - almost a year has passed since i explored south korean's second largest city (apologies for the lapses of hiatus and delays in travel logging). even so, such vivid unforgettable memories of exploration and delicious food experiences remain, distinctly reiterating my love and fascination for this port city. it was a moment back in 2015 that had sparked my story with busan - and it had to do with gamcheon culture village. 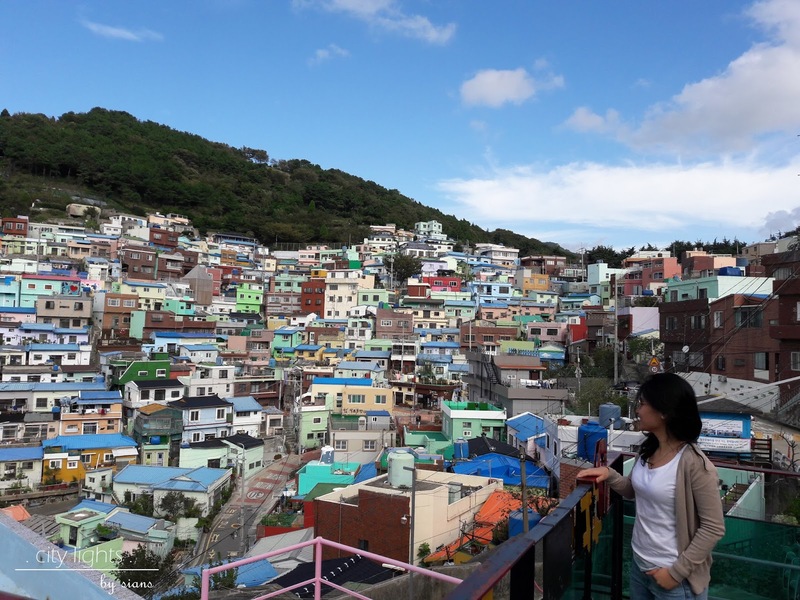 dubbed as the "santorini of the east", the beautiful colorful village on the hillside by the coast had me at first sight. that was the only push that i needed to purchase my flight tickets almost a year in advance and the rest was history. 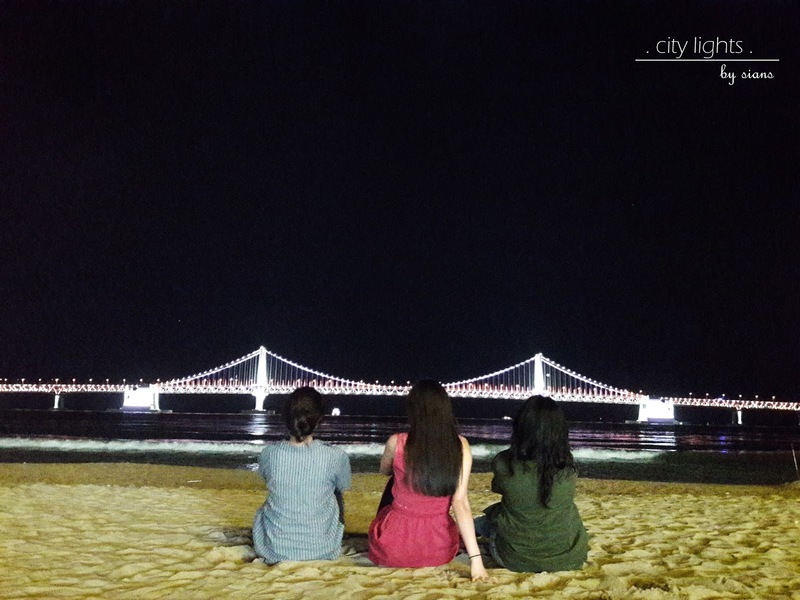 truthfully, it's kinda funny it had never crossed my mind before that to travel to "dynamic busan, city of tomorrow". 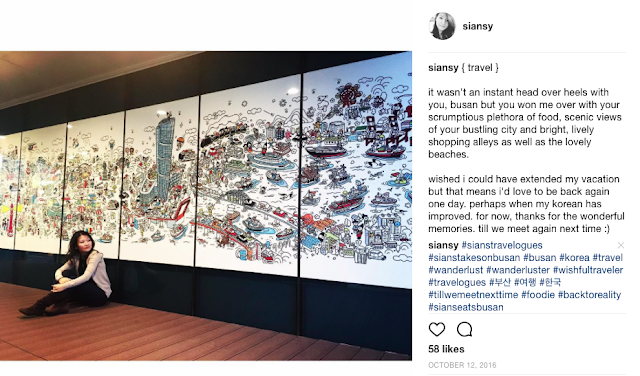 while i started on my personalized travel guide book to capture the bucket lists in busan but work had taken up so much time that i left most of the planning to my travel companion and shared some of my finds to get to our final travel blueprint. 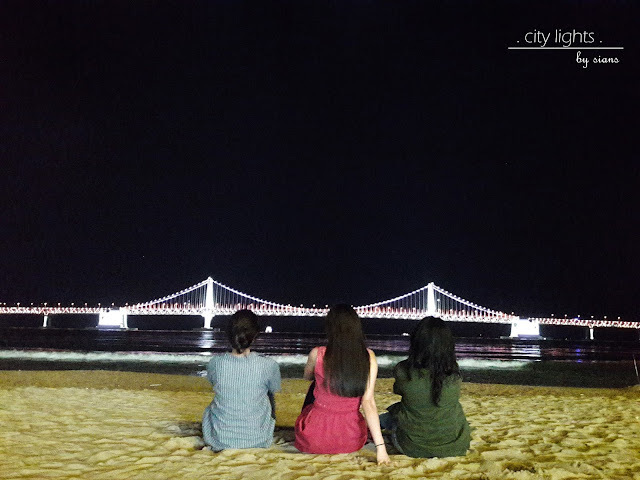 researching on the internet for our bucket lists of must sees, must eats and must dos in busan was somewhat limited. while there were lists of "top things to eat in busan", not many had "top things to eat in busan and where to eat them" -- at least in english. mustering my child-like skills of the korean language, i raked through some korean websites (painfully) to get some top restaurant lists. ....but just hours before our flight, i received a text from my dining companion on an email from the airlines. typhoon chaba was enroute to japan but had skewed slightly from its course to hit the southern tip of south korea. our flight was delayed or worse, it could be cancelled. that had made me pause just for a sec - my last trip to seoul was also delayed because of a typhoon. nonetheless, we were on the plane ten hours later and were greeted by the sunset, instead of the sunrise as our plane arrived to the port city. we had lost almost a day and had to reshuffle our plans to move the beach visits towards to end of the vacation, just in case. getting to our accommodation was challenging with the change of train lines but i had to blame it on our luggages, lack of elevators and the walk up the hill before we got to our destination. it was in chinatown with the familiar chinese themed arch and a few korean chinese restaurants lining the streets. the streets were quiet and a little lonely which could be a little scary for solo travellers. i was scanning the neighborhood when i spied the 24 hour convenience store nearby and made a mental note of its location to buy our supplies for early quick breakfasts of ramen. we were hugely thankful for the existence of the elevators at our accommodation as the friendly host brought us to our room before listing the amenities and the house rules. (he conversed in fluent english) cleanliness, space and comfort are my top must haves where all three were checked off. add on a mini kitchen, tv with all the korean shows (some english channels are available too), a fridge (not those puny, mini ones), a washer and a dining counter. easily accessible via public transport and throw in the reasonable price tag, we concluded that mint paradise busan was an excellent find. this entry is just the start of my #sianstakesonbusan series that shares my travelogues and food reviews in busan on my week long adventure of exploring by walking, experiencing the local culture, devouring delicious korean delicacies and a whole lot of sightseeing. weather was perfection minus a few nights where it was chilling and we were underdressed for the occasion. oh, and there was also the one written about suminine. "what do we demand of the perfect hamburger? that the meat patty be profoundly beefy in flavor, mouthwateringly browned on the outside, and succulent (a combination of juicy and tender) on the inside. the bread or bun should not interfere with any of these virtues. it should be soft, mild, and unassertive; it's job is to absorb every last drop of savory juice trickling from the meat while keeping the burger more or less in one piece and your hands dry." jeffrey steingarten, an always precise food critic and writer, has decidedly listed the virtues that define THE perfect hamburger. "mouthwatering, beefy, juicy and tender - not too much to ask from life but entirely elusive, at least to me. it's not as though i haven't tried. God knows, i've tried"
mr steingarten is also a man with a brilliant food mind, whom i have utmost respect for and look up to as my inspiration for my foodie ways. so who am i to argue on his views of the quintessential hamburger? valid points but these are merely the foundation that is mandatory for the perfect hamburger to build on; throw in a few more essential pre-requisites: a beautiful deep brown crust where the flavors are concentrated (think the maillard reaction) on a thin beef patty (not a fan of the thick patties - at that point, i'd rather go with a steak) cooked medium rare/medium on the griddle. hmm... perhaps, those are more like my preferences. // the maillard reaction - also known as the browning reaction - is a series of chemical reactions that take place when protein-rich foods are heated. large proteins break into smaller compounds which react with others, recombining into new configurations. they break apart again, recombine, and on and on in a cascade of chemical reactions that creates hundreds of brand new compounds." sometimes keeping it simple is the way to go - the good ol' cheeseburger (with a ton of cheese, of course). even so, there are always those days where bacon, sauteed mushrooms, avocado, caramelized onions add ons can either elevate the flavors or accentuate the beefy greatness to a greater intensity when intricately paired. THAT is my ideal hamburger. and these were the qualities i was looking for when i was picking out one of their renditions under the crust seared burgers menu at kgb, short for 'killer gourmet burgers'. its industrial inspired setup was akin a shack with exposed red bricks as its backdrop where the brightly lit sign hung above the menu behind the counter. once orders and payments were made over the counter, i took my metal number tent and picked a wooden table with metal chairs for two, while waiting my dining companion to complete her order. stamped with its signature logo on the top of the bun, and the cheese melted on the seared beef patty glistened slightly in its juices under the spotlight (literally... well, there was actually a bright lamp just right above the table). the juicy patty was cooked almost to the doneness i had requested for - medium-ish, begging for just a slightly more crust to the sear and another sprinkle of salt and pepper. the patty comes apart effortlessly with every chew in the mouth, intensifying the beefy flavor that shone behind the melted cheddar. it paired beautifully with the slight sweetness of the caramelized onions but the bun fell short (i frowned momentarily) - it was dry. while all these time, the shack sauce was benched on the side as a spectator. there's a history between us, the shack sauce and i. my first kgb experience was a few years ago when i had gotten myself the same burger. my burger had been over-sauced, the sauce overwhelmed the palate and casted an eclipse over the beef patty. this time, i cautiously dipped my burger lightly in the shack sauce and took a bite - creamy with whispers of light spicy tartness. my personal inclination remained the same - without the sauce, please. weak against fries, i succumbed to ordering a basket of fries with just salt and pepper to be shared. medium thick cut, deep fried but not too greasy. but most of them were not crispy enough either. tldr // kgb starts their burger with the right stuff: all natural thin beef patties, seared crusted just enough to lock in the juices in the beef. some fixing are needed though, the dry bun distracts from the patties and the shack sauce - strong in its presence (sometimes too strong) may overwhelm the tastebuds. get those right, then we may have something great in our hands. obviously excited and quietly whispering "OMG" to myself while texting my foodie friend in bangkok, i doubled back slightly to find that the first outlet in malaysia has still some ways to go in the making. that was three to four months ago. that was also how long i agonized/anticipated until the day it finally welcomed diners through its open doors where i jumped at the first opportunity to dine when i finally found a willing dining companion within the first few days. priding itself with a 125-year long tradition through five generations, paul kept its signature trademark front that paired effortless with the checkered black & white floors where the golden pastries and the bright colors of the fresh fruit tarts flirtatiously beckons you over from behind the glass case. i was almost distracted by the golden brown pastries until my dining companion pulled me back to the maitre d's desk to request for a table for dinner. shifting my attention between the open dining space centered around the espresso machine station and the french-english inspired dining space, we promptly made out choice and walked through the open french doors into the latter. the gold accented trimmings framed paintings against the off white walls. multi-colored chairs pushed in against the light brown tables where the familiar paper place mats are laid as the server placed the menu on our table. slightly nostalgic, it took me aback very briefly to my first encounter with paul patisserie - a heavy brunch of crepe and super thick hot chocolate in rabat, morocco and my second in the form of pastries take out during my quick layover at dubai airport, both on the same trip. that was merely three of the paul patisserie locations in 33 different countries, globally. flipping through the menu, it featured french classics - mains and sandwiches but my dining companion, who had tried its franchise in philippines, was surprised at the limited selection for the main dishes. she skipped ahead and spent more time poring through the dessert pages even when her mind was already made up for her dessert choice. i was left with an unshakable need for a hearty grilled cheese sandwich after a friend had showed me a picture of one just a few days prior. unknowingly, my cravings had made my main dish selection quick but i still had an inner struggle to pick only ONE dessert off the menu.... okay, maybe two - one for here and another to go. and perhaps also a piece of their baked breads. or could i instead get two...? the server returned to our table just minutes after, our faces immediately fell when she broke the bad news that neither of our dessert choices were available (i ordered tartelette aux fraise - crème pâtisserie and strawberries while my dining companion desired millefeuille chocolat - the napolean with chocolate crème pâtisserie). back to the menu, we went searching and as we named our second choices, to which our server shook her head, signaling their unavailability. we finally agreed to share one of the few available desserts, disappointment still looming over our heads. it didn't help alleviate the frustration when the server returned for a third time when they ran out of the iced tea i ordered. in my head, i was imagining myself causing a scene and asking what is NOT unavailable on the menu. but i didn't. still, it wasn't an impressive start to the evening. starting with a complementary basket of bread of just plain bread slices, it paled in comparison to the one i had at its moroccan counterpart where they served a variety of bread, one of which featured olives and served with softened french butter. here, they didn't even serve any butter. halved diagonally and served with a simple side salad tossed in a light tart dressing, this no-ham twist that had the beginnings of a croque monsieur, was filled with decent amount of lightly sweetened caramelized onions and juicy slices of slightly tart tomato, contrasted against the melted nutty, mild flavored emmental crust; the soft but firm pain de mie was missing some crisp edges. i wished for more cheese, especially with that steep price tag for a french version of a grilled cheese sandwich. the fragile golden brown bruleed sugar top instantly cracked (in a satisfying manner) under the light tap of the dessert spoon. the creamy custard was smooth, borderline runny but oddly enough, had an occasional curdled texture on the tip of the tongue and eggy undertones. the custard was lightly sweetened to accommodate the sweet, crispy layer of caramelized sugar, it would have been better with a more pronounced vanilla running through the custard. while the bruleed top was on point, a little tweaking could take this rendition of this traditional dessert to perfection. i ordered a "to-go" dessert (it was a tart aux myrtle - the blueberry tart) but i figured it wouldn't be a fair review since i didn't get to it within the next day. thus, i'd have to reserve my thoughts, at least for now. tldr // paul pâtisserie & boulangerie has a menu that is rooted in its 125 year tradition, serving french classics that were featured in all of my three encounters in different countries. it all highlighted one similarity - paul's strength lies in the breads (which translates to pain in french). while i'd imagine the same high quality in their renditions of tartelette and millefeuille, i'd love to affirm my suspicions during my next visit despite the steep prices. however, the contrasting quality at paul kl from the rest is also its biggest flaw - the service...or rather the lack thereof. the service was slow, uninformed and unorganized. my biggest pet peeve was the unavailable menu items especially the sought after pastries & desserts despite it being still pretty early into the dinner service. but for now, i'd stick with the pain, tartelette, millefeuille and the likes - oh, and can i get it to go please? we stared intently down the slightly busy main street. one bus approached but we quickly shifted our attention to another one coming down the road as we realized it was not the right bus number. we sighed as we looked at our watches. we were starving after a spending four hours at the spaland and now we had the dilemma of either taking a cab or to wait for bus that may not even come to get to our dinner spot in haeundae. after a few busses whizzed past us (they weren't the right ones either), we took a chance with my shaky korean and asked one of the taxi drivers who were parked in the taxi line if he knew how to get to su-min-i-ne. 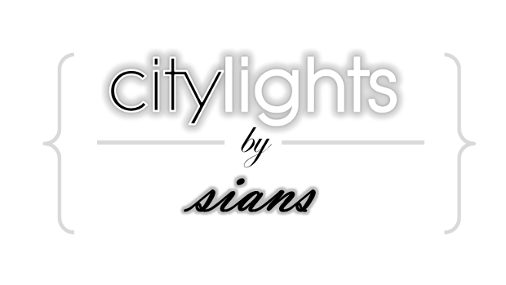 after a few seconds of hand gesturing, we were driving through the inner narrow lanes of dimly lit housing areas. i was beginning to worry that he may have misunderstood my korean but i breathed a sigh of relief when we saw the brightly lit signs of that read SUMININE on one and 수민이네 on the other. we took refuge inside the restaurant from the chilly evening, occupying one of the round metal tables instead of picking out a tent outside. we hung our coats on our own plastic chairs and took a quick glance around the brightly lit restaurant that was lined with windows. realizing we were surrounded by mostly local diners who were pairing their grilled seafood dinners with local beer, we thrilled that we may have found a real food gem in busan. thinking how i'd order without a menu, it was a huge relief when our order was taken in english. the owner had brought out a plateful of scallops, clams and mussels as a sample as we picked out all but the mussels (my dining companion didn't care too much for them) for two and a half order of fresh eel to be grilled. several minutes later as we cozied into our seats, the cook brought out the hot grill, nestled it in the middle of the table and began to place the half shells over the the open fire. a feeling on anticipation and excitement grew like the flame but slowly a mild disappointment started to set in when he removed the clams and scallops from their half shell and combined them in a aluminum foil bowl placed over the open fire grill. firstly, it felt like i was on a camping trip, albeit just for a moment. it was unexpected but the umami of the first clam had quickly quieten my concerns. a tent could have been set up around our metal table and a sign that reads 'flavor concentration booth' pegged all around us - because that was exactly what each bite was. the natural sweetness was accentuated by merely nudging it in the right direction with the addition of aromatics. the most intense flavors concentrated in the broth - the freshness of the shellfish did all the heavy lifting where my favorite flavors of the mild brine notes against the sweet scallops had concentrated in the broth. i had unintentionally stared as one waitstaff made her way to the next table carrying a huge pot of steaming korean ramen soup before i glanced expectantly over at my dining companions; i chuckled slightly when i realized they were doing the same. "라면 하나 주세요!" i asked the wait staff who repeated my one order of ramyeon, looking at me briefly, with a small smile before saying "한국어 잘했어요" ("you are doing well with the korean language") to which i smiled and nervously responded that i only knew very little. still beaming, i shifted my attention to the grilled eel on my plate. unseasoned, i picked up a piece of the fish with my chopsticks, still warm and slightly charred from the grill, dipped generously into the bean paste before wrapping it in the shiso leaf. crispy burnt edges against the meaty texture of the very fresh fish. it didn't quite leave as lasting of an impression like the scallops and clams did; the tiny bones of the eel didn't help either. we were left wanting more of the shellfish and i was the first to volunteer when the broth left in the aluminum bowl was up for grabs. instant korean noodles may not be the favorite to some, but i am a fan of the ramyeon ( so are my other dining companions). at 2,000 won, we appreciated the warmth that filled the belly, great way to finish our meal on a chilly fall night. with 2,000 won for the ramyeon adds to a total of 52,000 won for the complete meal of the freshest grilled sweet shellfish and eel, a reasonable price tag. i had a chance to speak to the owner very briefly as he had been so nice and accommodating to call for a cab for us to get back to the closest subway station. i had been so curious about why he spoke english fluently and also learned that the restaurant was named after him.